Following on from our post yesterday on the silky smooth skills of US diplomats, the Nicaragua Network have issued a press release about their meetings last week with United States representatives in Nicaragua. We publish their press release below, and await their full report to follow soon. Despite these comments by Matthew Roth, the political officer of the U.S. Embassy, the U.S. Agency for International Development is funding Nicaraguan groups to provide training in “democratization” and media skills. In the 2001 and 2006 presidential elections, the U.S. embassy overtly supported a particular candidate opposed to Ortega. Such public declarations have not been issued this year, although the delegation heard concerns about the possibility of threatening or leading public statements from US officials late in the campaign term as occurred in 2001 and 2006. Such prior statements included threats about the termination of remittances, which many Nicaraguan families rely on. Additionally, the US has urged and even organized a united opposition in past elections. In the current cycle, a representative of the Constitutional Liberal Party implied that the party has privately been encouraged by the US Embassy to withdraw from the race. Yesterday marked the 25th anniversary of the World Court decision of the case brought by Nicaragua against the United States. The judgment was a landmark, so much so that world jurists have been marking the occasion with a conference in the Hague to look at the long term effect the ruling had. Sadly, the impact was less in Nicaragua itself. Despite clear findings by the Court of massive interference by the United States (see here for a summary), when the Sandinistas lost the elections in 1990, the new President, Violeta Chamorro, withdrew the case (and the billions of dollars claimed in damages) from the Court. Whilst Roth has obviously attended the Bonehead School of Diplomacy, at least it is an honest and accurate reflection of the contempt US Embassy officials have for Nicaraguans, something which has been revealed previously in a series of rants masquerading as cables from the US Ambassador. It also reflects that the United States feels it has the right to pick and choose which politicians can win in Nicaragua. It’s support for bogus civil society organisations, such as the Movimiento de Nicaragua, is well known, and is a re-play of previous elections, including the traumatic 1990 election when the Sandinistas lost off the back of a decade long counter-revolution and a devastated economy. They usually also manage to throw their weight behind a right wing candidate, but this time have been unable to either find or engineer one to their liking. Unable to field a ‘united’ right wing candidate, the next page in the US play book is to discredit the elections. They have been doing this since 2008, adding their voices to the chorus of critics inside Nicaragua. This has also been mixed with a campaign to discredit Daniel Ortega’s candidacy. Through the use of constitutional contradictions, and deft political maneouvring, Ortega played one part of the constitution (the right of every citizen to be treated the same) against another (the limiting to two terms of any President, and not able to serve more than one consecutive term). The Court ruled in his favour, repeating something which Oscar Arias achieved a couple of years ago in Costa Rica. Where you stand on Ortega’s candidacy can sometimes be a matter of how you like your politics. Looking at the record of some politicians (Blair’s disastrous second and third terms in the UK), even a one term rule seems very attractive. But Ortega’s candidacy has not been portrayed as a legal challenge or a constitutional conundrum, but more of another step on the road to dictatorship. It is this view that is carried far and wide by the international media, with the other side of the story hardly aired. Tortilla con Sal have just produced a short film with three of the protagonists at the eye of this particular storm – Roberto Rivas, President of the Supreme Electoral Council; Rafael Solis, a Supreme Court magistrate; and Alba Luz Ramos, President of the Supreme Court. They explain the constitutional challenge issued by Ortega, and how the contradictions were resolved. As well as campaigning and raising awareness on Nicaraguan political, economic and social issues, we also raise a small amount of money to support projects. For the past three and a half years we have raised nearly £20,000 to support the Los Quinchos project, which works with children who live and work in the La Chureca dump in Managua (see here for a previous post). Our donations support seven workers, together with contributions from the US NGO ProNica, which pays for one meal a day for the children. It’s an uncertain time for the Centre. The ‘capping’ of the dump, paid for by Spanish aid, is almost complete, and in the last month building of new homes has started, to replace the flimsy structures most people in La Chureca live in. Whatever the future for the dump, the workers and the people who live there, the future of Los Quinchos’ project in La Chureca will not be decided until the end of the year at the earliest. In the meantime the Campaign is still trying to raise over £400 a month for the Centre, not easy in the economic recession. Our latest fund-raiser will take place next Saturday, July 2, our annual sponsored walk. You can find more details here. We will also be branching out with a new fund-raiser. 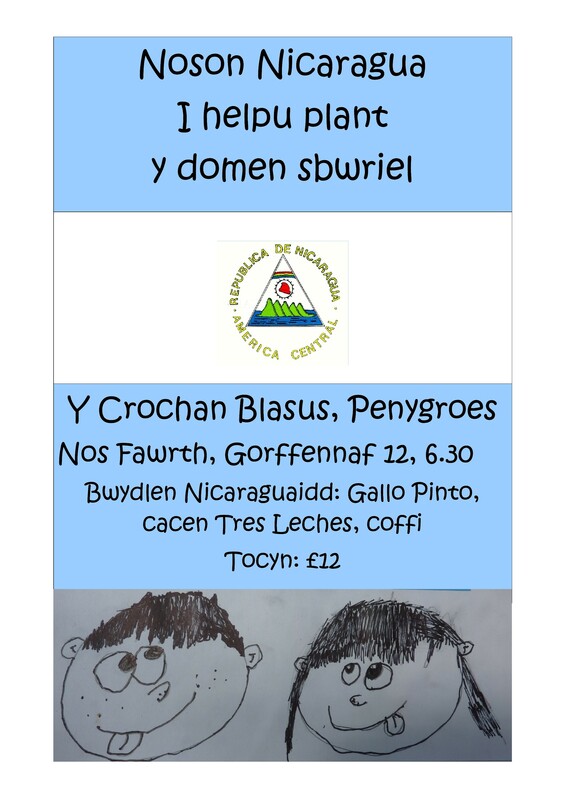 We have organised an evening with Nicaraguan food – gallo pinto and tres leches cake – on July 12 in Penygroes. See below for more details. If you can’t make either of them, you can still donate on line. Click here to go to our fund-raising page. The Welsh youth movement, the Urdd, one of the biggest in Europe, has accepted the yankee dollar, from McDonalds and Coca Cola. If it’s good enough for the Olympics, it’s good enough for the Urdd. Well, perhaps there are a couple of problems. How many spoons of sugar in a can of Coke? Eight. So we can look forward to Welsh children excelling at athletic competition, but wearing dentures to do it. What about the Urdd’s famed commitment to internationalism? There’s lots of examples where Coca Cola factories have opened in poor communities, and have caused huge access problems to water for the local population (who can’t, usually, afford ‘the world’s favourite drink’). See here for an example from Latin America, in Chiapas. If Chiapas is bad enough, what about the connections between Coca Cola and the people who murdered union activists in Colombia (see here to read the allegations). Some of us can remember the famous Coca Cola jingle, I’d like to teach the world to sing. Someone who learned (but perhaps not under the influence of the corporation) was the US anarchist David Rovics. For another Cola flavour, see his song ‘Coke is the drink of the death squads’. Did Mr Urdd need to take the Coca Cola dollar? Another Welsh icon who refused 1.8 million of them was Super Furry Animals, after going to Colombia and talking with workers there. Efa, send the money back! Mae’r Urdd wedi cymryd y ceiniog corfforaethol, y tro hwn gan McDonalds a Coca-Cola. Os mae’n digon da ar gyfer y gemau Olympaidd, mae’n digon da ar gyfer yr Urdd. Wel, efallai mae sawl problem bach. Faint o lwyaid o siwgr mewn can o Coke? Wyth. Felly rydym yn gallu edrych ymlaen i blant bach Cymru yn ennill llawer o wobryon athletaidd, ond yn anffodus tra gwisgo dannedd gosod. Beth am y cysylltiad enwog rhwng yr Urdd ac achosion rhyngwladol? Heb os, mae llawer o enghrefftiau lle mae ffatri Coca Cola wedi agor mewn cymuned tlawd, ac wedi achosi problemau enbyd mynediad dwr ar gyfer y boblogaeth lleol (sydd, fel arfer, ddim yn gallu fforddio ‘the world’s favourite drink’). Gweler yma am un enghraifft o America Ladin, yn Chiapas. Ond os mae Chiapas yn digon drwg, beth am gysylltiad Coca Cola gyda phobl a lladdwyd undebwyr llafur yng Ngholombia (gweler yma i ddarllen y honiadau)? Mae rhai ohonom yn gallu cofio jingl enwog Coca Cola, I’d like to teach the world to sing. Rhywun a dysgodd (ond efallai nid dan dylanwad y corfforaeth) oedd David Rovics, anarchydd o’r Unol Dalieithau. Am flas arall y Cola, gweler ei gan ‘Coke is the drink of the death squads’. Oedd angen i Mr Urdd derbyn $ Coca Cola? Un eicon Cymreig arall a wrthododd oedd Super Furry Animals, 1.8 miliwn ohonynt, ar ol mynd i Colombia a siarad a gweithwyr yno. Efa, rhowch yr arian yn ol! The present governments is working to make sure that the people have a regular income, enough to support a family and their basic needs. Domingo Perez, General Secretary of UNE, will be speaking in Cardiff on Wednesday (see previous post here for full details). In the meantime, a lengthy interview with Domingo has appeared in La Prisma, about his visit to the UK, and the improvements the Sandinistas have made for trade unionists and the general population over the past four years. If you’ve had enough of the dubious Latin American journalism peddled by Rory Carroll of the Guardian, or the stuff from his equally evil US twin Tim Rogers, then there are other sources available than reading Tweedledee and Tweedledum. A couple of regular useful summaries of information have just been updated. There is the monthly bulletin from alborada, put together by journalist and film maker Pablo Navarrete. Pablo, who spoke at a Campaign screening of his film on Venezuela in the autumn, features the recent election in Peru, a book on the fascist Pinochet in Chile, a film about teenage miners in Bolivia, Brazilian music, and a comeback from the Zapatisitas. It also includes an article by Pablo himself, US flops after leak show, which adds to our recent posting on Wikileaks. 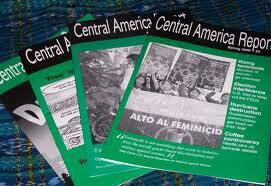 Aslo recently out is the Central America Report, put together a number of solidarity organisations. The most recent issue has a number of articles about Nicaragua. It also includes an update about the Community of Latin American and Caribbean States (CELAC), which excludes the US and Canada, and which looks like it will grow to replace the discredited Organisation of American States, which has been a tool of US foreign policy since it was established in 1948. Another source worth checking out is the newly launched website of our sister organisation, the Nicaragua Solidarity Campaign Action Group. It concentrates on building links between British trade unions and their Nicaraguan counterparts.